“The work in Raglan marks an exciting and important milestone..."
A team of specialist submarine cable experts will arrive in Raglan this month to lay the first section of the Tasman Global Access (TGA) undersea cable. Telecommunications companies Spark, Vodafone and Telstra are investing approximately USD $70 million to build the TGA cable, designed to significantly improve New Zealand’s international broadband connectivity. 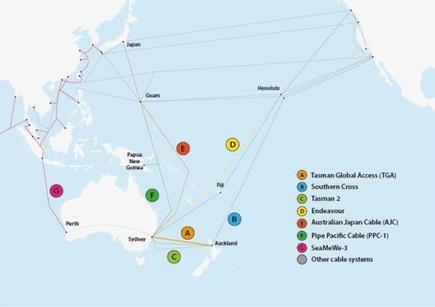 Other benefits of the new cable include strengthened links into fast-growing Asian markets, important redundancy and resiliency, and better connection with the five main international cable systems currently serving Australia. The consortium of Spark, Vodafone and Telstra have contracted Alcatel-Lucent Submarine Networks (ASN), now part of Nokia, to lay the first cable between Ngarunui Beach at Raglan and Narrabeen Beach in Australia. Spark’s General Manager Wholesale and International, Lindsay Cowley, and Vodafone’s Wholesale Director, Steve Rieger, jointly commented on behalf of the consortium. “The work in Raglan marks an exciting and important milestone on the journey to having the TGA cable ready to start carrying data across the Tasman towards the end of 2016,” both telcos state. “The first stage will see the crew of the MV Tranquil Image - a specially fitted out New Zealand vessel - bury a three kilometre stretch of fibre optic cable from Ngarunui Beach, through the surf zone and into the ocean. Read more ​Who is NZ’s leading mobile brand? The cable laying activities at Ngarunui Beach are scheduled to commence on 29 March and this first stage will take approximately one week to complete with the consortium cautioning that weather conditions may impact the schedule. “The goal is to complete this first stage as quickly and seamlessly as possible, however the health and safety of the crew, and the public, are our first priority,” Cowley and Rieger add. The TGA cable is currently on track to be completed, tested and ready for service by the end of 2016 - the 2,300km length of cable is comprised of two fibre pairs, and will have a total capacity of 20 terabits per second.